Member of the Rosaceae (rose) family. Related species include apple, peach, pear, potentilla, hawthorn, spirea, cotoneaster. Small delicate flowers occur along woody branches. Stems can be cut to various lengths. Branches may be thorny. Plant is a deciduous shrub, classed as a dicotyledon, leaves not parallel veined. The fruit is used for making jelly. 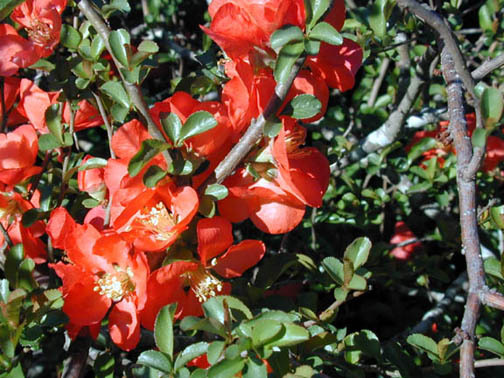 Chaenomeles is a compound Greek word meaning split and apple. Cut dormant branches can be forced into bloom by immersing them in 82F water for 12 hours, then placing them upright in opening solution at 59-64F and high humidity for 1-3 weeks.